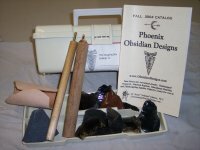 On this page is available for purchase pre-assembled Kits of various Percussion and Pressure Flintknapping Tools available on the other supply pages. They range from basic kits for Beginning Flintknappers to more Advanced options. On this page are some of the tools necessary for percussion reduction work. This stage of Flintknapping produces the flakes or blanks to be Pressure Flaked into a final form or simply used as Percussion Blades. Tools offered here include Hammerstones and Lap Shields. The Tool selection is guided by Dr. Arizona's personal technique preferences. On this page are some of the tools necessary for pressure reduction work. This form of Flintknapping is the fine detail work which shapes percussion flakes or blanks into a final formed tool. Tools offered here include Pressure Flaking Handles and Palm Guards. The Tool selection is guided by Dr. Arizona's personal technique preferences. On this page are some general tools used by flintknappers. Included herein are such items as tarps, first aid supplies, and other tools useful in both pressure and percussion work. Also found here are current specials and items that are available in small quantities for only short periods of time. 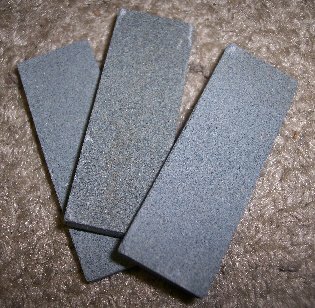 On this page are selections of Percussion Flakes which are ready to be pressure flaked. Currently there are only limited amounts flintknapping material available until we can arrange some more stable sources. Prices are relative to our own limited supplies rather than external factors. We seriously suggest finding local material supplies due to shipping costs. Shipping for orders containing a Flake Selection is a minimum of $10.00. 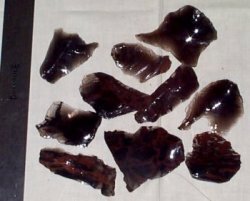 On this page are some resources which may help you learn how to Flintknap or may help you improve your Flintknapping. 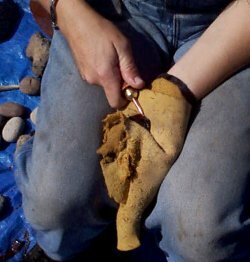 Tools offered here include a Flintknapping Video and links to various Flintknapping books and lessons. This section of the website is currently undergoing further development. 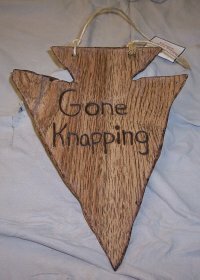 On this page are items which make good gifts for any flintknapper. Offered here are many individual items as well as Gift Baskets.